Leeds United's assistant head coach Paul Raynor has said that chairman Massimo Cellino is still positive, despite fan protests at Elland Road. A 'Time To Go, Massimo' poster appeared on an advertising board outside the East Stand on Thursday. The poster was paid for by supporters angry that Cellino has not sold his 75% share in the Championship club. "He has been very positive even through the dark days and bad performances," Raynor told BBC Radio Leeds. "People will do what they want - they'll protest or they won't protest. If we win some football matches there will be less people protesting." 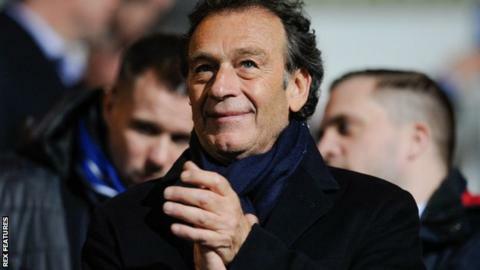 Cellino agreed in principle to sell his majority share to supporters' group Leeds Fans United in at the end of last October, but changed his mind a week later. Fans have also been left angry about a 'pie tax,' which saw the club raise the price of Championship tickets in the South Stand by £5. Cellino is currently appealing a ban from the Football League that would prevent him running the club. "(Cellino) has talked about the future. He has been supportive in bringing in the three players we've already brought in," Raynor added. "The biggest frustration for us is that we haven't been winning as many games as we should and that doesn't help matters." Leeds, who are currently 16th in the Championship, have won just one of their last eight league games. Read more on Price of Football: How much has changed in five years?